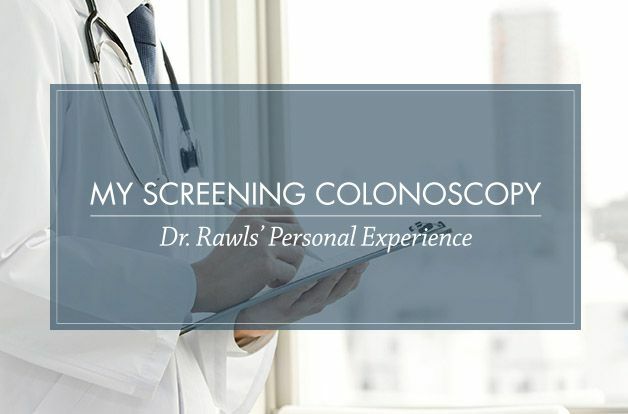 Dr. Rawls’ sheds light on his personal experience with a screening colonoscopy—a procedure that saved his life. I was well overdue, even though a screening colonoscopy is something I agree with and recommend. It is one of the very few screening procedures that actually saves lives. Colon cancer forms in a polyp attached to a stalk hanging from the wall of the colon. It grows until it finally invades the wall of the colon. If the polyp is removed before cancer forms, or at least before it invades the wall, then simple polyp removal is curative. Polyp removal can be performed during the screening colonoscopy without additional surgery. This wasn’t my first colonoscopy. I had a history. During my mid-to-late forties, my intestinal tract was a mess. I had been managing chronic lifelong constipation by consuming massive quantities of Raisin Bran with milk and other whole grain products (all recommended by nutritionists). But everything just kept getting worse. A gastroenterologist recommended a colonoscopy and I complied. He found three adenomatous polyps (the kind that can lead to cancer) and noted that my entire colon was significantly inflamed. Shortly thereafter, I abandoned the prevailing nutritional wisdom of the day and sought a different path. I gave up wheat products completely (and later most grains), along with most dairy. Processed foods were eliminated and vegetables became my primary food source. Four years later, at age 51, I had a follow-up colonoscopy. No polyps were found, but my colon was still inflamed. A follow-up colonoscopy was recommended in another five years. That was seven years ago. I was now two years past getting the recommended follow-up colonoscopy. Life had been busy and my intestinal function had improved significantly, so it was easy to put it off. By then I was also taking regular doses of herbal supplements that I had confidence would reduce risk. I had read studies linking colon cancer to inflammatory pathways related to the COX-2 enzyme and that aspirin (a COX-2 blocker) could reduce the risk of colon cancer. Aspirin, however, comes with a list of concerning side effects and problems. I also knew, however, that turmeric (a spice found in Indian curry) was a COX-2 blocker. Turmeric is not associated with any of the side effects or problems that aspirin has. I was taking (and still take) a dose of turmeric every day, along with other anti-inflammatory herbs. Still, a nagging concern lingered in the back of my mind. Because of the original polyps, I was considered high risk for colon cancer. A dream one night of a cancerous polyp prompted me to make an appointment with a surgeon and schedule the procedure. The fasting and purging required for the colonoscopy really weren’t that bad. The procedure was fairly quick and not unpleasant. Best of all, no polyps! Plus, the tissues of the colon appeared healthy! Over a 12-year period, I had gone from high risk for colon cancer at an early age to low risk, simply by changing my diet and embracing a lifestyle that included natural herbal supplements. The American Cancer Society recommends a screening colonoscopy for all adults starting at age 50. If the colon is clean, rescreening is usually scheduled for another 10 years. If polyps are present, rescreening is recommended for three years later. Earlier screening is recommended for those with a family history of colon cancer or history of chronic intestinal problems. Most insurance companies cover the total cost of screening colonoscopy. Testing for blood or abnormal DNA in stool samples are additional screening options but are not nearly as sensitive as colonoscopy. A screening colonoscopy is a procedure worth having, because it could just save your life. As the American Cancer Society says, “If all adults 50 and older were screened for colon cancer, we could cut the death rate from this disease in half, saving tens of thousands of lives every year.” If it’s time for you to have a screening colonoscopy, don’t wait. Schedule your colonoscopy. Reach out to us on Twitter or Facebook, or email info@rawlsmd.com.